Pork belly with lentils is a typical French bistro dish. 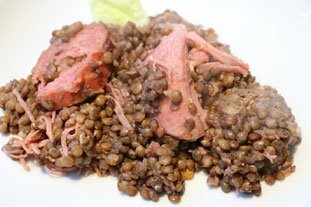 In principal, it is a mixture of different cuts of pork, usually salt-cured, cooked slowly until "confit" and meltingly tender, served with lentils cooked in stock. This dish takes a good while to prepare, but it's a real treat! It reheats very well, tasting better each time, so do make plenty in one go.